TICKING OFF THE FOODIE HEAVEN LIST! The 2018 list of Asia’s 50 Best Restaurant was announced recently and made me look back on the restaurants we dined at in 2017. It’s not just about the Top 10/50/100/1001 Things To Do Before You Die, it’s more about the Top 50 things we’ve already done. Live Life To the Full we always say! Geographically Asia’s 50 Best Restaurants (2017) are located as follows: Singapore and Bangkok have nine restaurants each, Hong Kong and Tokyo eight, Seoul has three, Taipei, Colombo and Macau two. There’s one restaurant each in Bali, Taichung in Taiwan, New Delhi, Osaka, Manila, Mumbai and Shanghai. We managed to get to fifteen of the 50 restaurants in 2017. And three of those we went twice! The cost of such experiences is high, but let’s face it, we’re not going down the local for a quick bite! Experiencing restaurants like these is not just a meal anymore; it’s a fully-fledged global experience that will last you a lifetime, not just until breakfast! 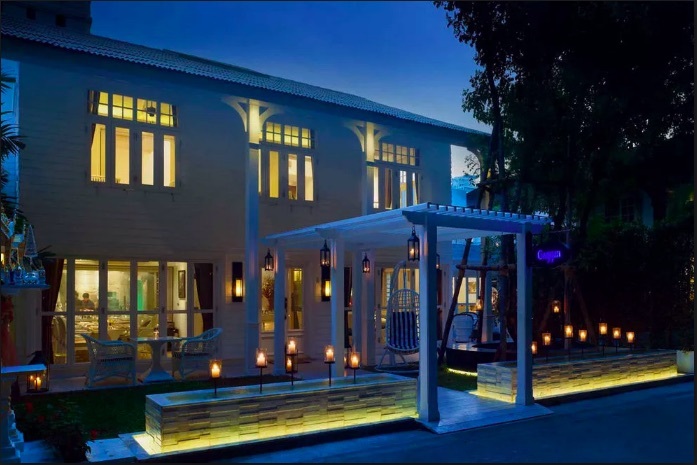 This first review here is about Gaggan in Bangkok (Asia’s number 1 restaurant). Keep an eye out for the rest of my restaurant reviews coming soon. Beautifully presented Concierge staff, beaming their famous Thai smiles Uniquely crafted wine list sourced from all over the world. A speaker on our table with the 1983 Kiss song "Lick It Up"
Our two experiences at Gaggan in Bangkok were the best. Rated No 1 in Asia again in 2018 (7th on the World’s 50 Best), from our point of view it’s deserving. Gaggan Anand’s arrived in Bangkok in 2007 and never left. The restaurant was the result of a drunken evening with his friends, where his frustration at previous jobs initiated an impromptu proposal to his partners, to which they gladly accepted! Gaggan has now been voted number one in Asia four years in a row. From the taxi to the stroll down a dark alleyway to the whitewashed colonial-style wooden house restaurant, the excitement built! We were greeted with warmth and those beautiful world-renowned Thai smiles. The Assistant Manager and Sommelier, Vibhi, who was an excellent hospitality professional was full of pride and passion for what he does and where he works! It’s safe to say that he talks more than me. It was a pleasure talking food and wine from around the world with him! He asked us to stay back afterwards to show us around the restaurant and especially the kitchen, where all the magic happens. Excellent. As expected with a restaurant like this, the wine list was curated very carefully to ensure the sheer array of flavours and textures (especially with Indian inspired cuisine) were not overpowered by the wine and vice versa. It is a well-balanced evolving list. Choosing a wine from such a list was always going to be a difficult task. So of course, there was a lot of discussion with Vibhi about what wines to have. Eventually we decided on one of our favourite regions, a beautiful Spanish wine from La Rioja (located in Northern Spain). 2004 Viña Tondonia Tinto Reserva (a blend of Tempranillo, Granache, Graciano, Mazuelo or otherwise known as Carignan) from a beautiful 140-year-old winery called Bodegas R. López de Heredia, just out of the township of Haro. We also lined up a lovely French dessert wine from Château Jolys Jurançon -Cuvée Jean. A family run winery with two women at the helm – awesome! It’s located in South-West France in the Jurançon wine region in the foothills of the Pyrenees. This area is well renowned for their sweet white wine from the lesser-known grape variety called Petit Manseng. But back to the emoji menu! Each dish is presented in its own unique vessel. I’m not going to through them all – you’ll have to go there to find out for yourselves but here’s some of the memorable ones. The first emoji was a watermelon. The dish was served on a giant block of Himalayan pink rock salt with an oyster shell filled with watermelon and pink elderflower ice cream perched on top. This was followed by a “Yoghurt Explosion”. This is one of Gaggan’s signature dishes. (the kaboom emoji). Combining his Indian roots and his time spent with Ferran Adria of elBulli in Spain, a silver spoon on a dedicated spoon platter housed a beautifully formed yoghurt sphere that explodes in your mouth. It actually tastes like the traditional yoghurt based drink, Lassi. Second dish in and we’re already giddy! Now the waiter comes over and removes our entire cutlery!! He places a little red speaker on the table instead! We both stop talking and check the emoji which is a tongue poking out! What-the…?? A plate arrives of pureed mushroom, peas and red peppers topped with shavings of black truffle splashed with the words “Lick It Up!” written in pea puree at the top of the plate. The waiter presses a button on the speaker and the song that starts blasting out is the 1983 Kiss song “Lick It Up”. Yes of course we licked it up! Delicious and hilarious, oh and I love truffles! Not to make things boring, the next emoji is…well…just a prawn! This dish is presented in a prawn’s head (complete with eyes and antennas) with a thin layer of crispy rice paper. It is used as a cone for the chilled tom yum cream. We ate the whole thing…I think we were supposed to!! It was excellent. Flower emoji – hmm what’s this about? The dish is called Flower Power. It was an intricately woven biscuit filled with, wait for it, goat brains, beetroot powder and a hint of wasabi. We were too young for the flower power era of the 60s but I wonder if these “groovy baby” feelings where what it might have been like. It was an amazing flavour. I have to confess, if I see brains on a menu, I tend to steer clear but this was a firm favourite. Probably best I didn’t know in advance! Hot Dog emoji. A pot plant arrives and the “flowers” are called sheek kebabs – spicy Thai lamb sausage with mango chutney on sticks. You take the stick out of the pot plant, tear off a leaf, wrap it around the kebab and voila! Who doesn’t love lamb really?! Possibly the most theatrical dish (ie flame thrower circus act) was the Thai Seabass with Bengali mustard curry (Seabass is possibly my favourite fish). Wrapped in a banana leaf with an outer envelope of cedar wood, which was then set on fire. Yep that was the emoji too! As it burnt it gave off an aromatic curry fragrance. Beautiful dish. The last four dishes were desserts. Rose emoji which was dehydrated beetroot presented as roses in vintage box, Milk cake Riesling Muscat (2 flutes clinking emoji) made to look like a Chinese Mid-Autumn Moon Cake followed by an Indian flag emoji which was a tribute to a favourite Indian desserts, Mango Saffron Ghewar. Finally my favourite for the fun and the flavour of it was the Minion Popsicle of lemon cheesecake! So make a booking in Bangkok while you can and just go! Women Of Wine is a wine events and education company designed to take the guesswork out of learning about wine through our customised events. We bring people together in a relaxed environment where they can learn enough to better enjoy wine in their everyday lives. Are you a woman who loves wine? Keep up to date with our events and boost your wine knowledge!